Modern life insurance bears some similarity to the asset management industry and life insurers have diversified their products into retirement products such as annuities. The face amount of the policy is the initial amount that the policy will pay at the death of the insured or when the policy matures, although the actual death benefit can provide for greater or lesser than the face amount. The policy matures when the insured dies or reaches a specified age (such as 100 years old). Based on the above and additional factors, applicants will be placed into one of several classes of health ratings which will determine the premium paid in exchange for insurance at that particular carrier. Most of the revenue received by insurance companies consists of premiums, but revenue from investing the premiums forms an important source of profit for most life insurance companies. Group Insurance policies are an exception to this. Upon the insured's death, the insurer requires acceptable proof of death before it pays the claim. If the insured's death is suspicious and the policy amount is large, the insurer may investigate the circumstances surrounding the death before deciding whether it has an obligation to pay the claim. Payment from the policy may be as a lump sum or as an annuity, which is paid in regular installments for either a specified period or for the beneficiary's lifetime. Life insurance may be divided into two basic classes: temporary and permanent; or the following subclasses: term, universal, whole life, and endowment life insurance. Permanent life insurance is life insurance that covers the remaining lifetime of the insured. A permanent insurance policy accumulates a cash value up to its date of maturation. The owner can access the money in the cash value by withdrawing money, borrowing the cash value, or surrendering the policy and receiving the surrender value. Whole life insurance provides lifetime coverage for a set premium amount (see main article for a full explanation of the many variations and options). Universal life insurance policies have cash values. Paid-in premiums increase their cash values; administrative and other costs reduce their cash values. The endowment policy is a life insurance contract designed to pay a lump sum after a specific term (on its 'maturity') or on death. Typical maturities are ten, fifteen or twenty years up to a certain age limit. Some policies also pay out in the case of critical illness. Policies are typically traditional with-profits or unit-linked (including those with unitized with-profits funds). Endowments can be cashed in early (or surrendered) and the holder then receives the surrender value which is determined by the insurance company depending on how long the policy has been running and how much has been paid into it. Such insurance can also be accidental death and dismemberment insurance or AD&D. In an AD&D policy, benefits are available not only for accidental death but also for the loss of limbs or body functions such as sight and hearing. Accidental death insurance can also supplement standard life insurance as a rider. If a rider is purchased, the policy generally pays double the face amount if the insured dies from an accident. This was once called double indemnity insurance. In some cases, triple indemnity coverage may be available. Riders are modifications to the insurance policy added at the same time the policy is issued. These riders change the basic policy to provide some feature desired by the policy owner. A common rider is accidental death (see above). Another common rider is a premium waiver, which waives future premiums if the insured becomes disabled. Joint life insurance is either term or permanent life insurance that insures two or more persons, with proceeds payable on the death of either. These are unique insurance plans which are basically a mutual fund and term insurance plan rolled into one. The investor doesn't participate in the profits of the plan per se, but gets returns based on the returns on the funds he or she had chosen. See the main article for a full explanation of the various features and variations. Some policies afford the policyholder a share of the profits of the insurance company—these are termed with-profits policies. Other policies provide no rights to a share of the profits of the company—these are non-profit policies. With-profits policies are used as a form of collective investment scheme to achieve capital growth. Other policies offer a guaranteed return not dependent on the company's underlying investment performance; these are often referred to as without-profit policies, which may be construed as a misnomer. The tax ramifications of life insurance are complex. The policy owner would be well advised to carefully consider them. As always, both the United States Congress and state legislatures can change the tax laws at any time. In 2018, a fiduciary standard rule on retirement products by the United States Department of Labor posed a possible risk. Premiums are not usually deductible against income tax or corporation tax, however qualifying policies issued prior to 14 March 1984 do still attract LAPR (Life Assurance Premium Relief) at 15% (with the net premium being collected from the policyholder). Non-investment life policies do not normally attract either income tax or capital gains tax on a claim. If the policy has as investment element such as an endowment policy, whole of life policy or an investment bond then the tax treatment is determined by the qualifying status of the policy. On April 17, 2016, a report by 60 Minutes claimed that life insurance companies do not pay significant numbers of beneficiaries. ^ "The Industry Handbook: The Insurance Industry". Investopedia. 2004-01-07. Archived from the original on 2018-09-07. Retrieved 2018-11-28. 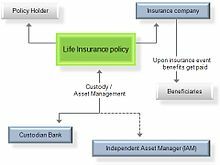 ^ "Industry Overview: Life Insurance". www.valueline.com. ValueLine. Retrieved 2018-11-28. ^ a b c "Importance of the Equitable Life Archive". The Actuarian Profession. 2009-06-25. Archived from the original on 2018-05-13. Retrieved 2014-02-20. ^ "Today and History:The History of Equitable Life". 2009-06-26. Archived from the original on 2009-06-29. Retrieved 2009-08-16. ^ Lord Penrose (2004-03-08). "Chapter 1 The Equitable Life Inquiry" (PDF). HM Treasury. Archived from the original (PDF) on 2008-09-10. Retrieved 2009-08-20. ^ "IRS Retirement Plans FAQs regarding Revenue Ruling 2002-62". irs.gov. Archived from the original on 8 August 2012. Retrieved 14 April 2018. ^ "IRS Bulletin No. 2002–42" (PDF). irs.gov. Archived (PDF) from the original on 2 May 2017. Retrieved 14 April 2018. ^ Rothstein, 2004, p. 38. ^ Rothstein, 2004, p. 92. ^ a b Rothstein, 2004, p. 65. ^ Kutty, 2008, p. 532. ^ "How do Insurance Rating Classifications Work?". Retrieved 4 November 2011. ^ Arias, Elizabeth (2004-02-18). "United States Life Tables, 2001" (PDF). National Vital Statistics Reports. 52 (14). Archived (PDF) from the original on 17 October 2011. Retrieved 3 November 2011. ^ OECD (5 December 2016). Life Annuity Products and Their Guarantees. OECD Publishing. pp. 10–13. ISBN 978-92-64-26531-8. ^ Black, Kenneth, Jr.; Skipper, Harold D., Jr. (1994). Life Insurance (4th ed.). p. 94. ISBN 0135329957. ^ "Section - 80C, Income-tax Act, 1961-2018:B.—Deductions in respect of certain payments". Income Tax India. Retrieved 6 November 2018. ^ "ITAA 1936, Section 279". Archived from the original on 2011-08-28. ^ "2018 Insurance Industry Outlook | Deloitte US". Deloitte United States. Retrieved 2018-11-28. ^ tchinnosian, dennis jay, jim quiggle, howard goldblatt, kendra smith, jennifer. "Fraud: why should you worry?". www.insurancefraud.org. Archived from the original on 13 November 2012. Retrieved 14 April 2018. ^ "Two Elderly Women Indicted on Fraud Charges in Deaths of LA Hit-Run". Insurance Journal. June 1, 2006. Archived from the original on November 4, 2006. ^ "Life insurance industry under investigation". cbsnews.com. Archived from the original on 8 December 2017. Retrieved 14 April 2018. Kutty, Shashidharan (12 August 2008). Managing Life Insurance. PHI Learning Pvt. Ltd. ISBN 978-81-203-3531-8. Rothstein, Mark A. (2004). Genetics and Life Insurance: Medical Underwriting and Social Policy. MIT Press. ISBN 978-0-262-18236-2. Wikimedia Commons has media related to Life insurance.